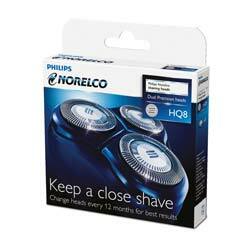 Philips Norelco HQ8 Replacement Heads provide a comfortable electric shave. The Super Lift and Cut dual-blade action lifts hair to cut comfortably close below skin level, and the DualPrecision System includes slots and holes to effectively remove long hairs and short stubble, resulting in a smooth shave. Flexing heads automatically adjust to the curves of the face and neck. The HQ8 replacement heads are compatible with the following Philips Norelco series: 7100 series, 7200 series, 7300 series, 7700 series, 7800, 8800 series, PT/AT700 series, and PT/AT800 series. If you do not see your model listed here, use the compatibility tool to determine the correct replacement head for your shaver. The DualPrecision shaving system is designed to effectively shave both longer hairs and short stubble for precise results and a smooth finish. The flexing heads keep the shaving surface in close contact with your skin for a fast and efficient shave. The replacement heads are equipped with the patented Super Lift and Cut System which is designed to give you a close and comfortable shave as the first blade lifts while the second blade cuts comfortably below skin level. Replace the shaving heads every year to keep your shaves close and comfortable. The shaving heads are easy to replace. Switch off the razor and disconnect it from the power outlet.Press the release button to open the shaving unit.Turn the lock anticlockwise (1) and remove the retaining frame (2).Remove the shaving heads and place new ones in the shaving unit.Make sure that the projections of the shaving heads fit exactly into the recesses.Put the retaining frame back into the shaving unit and turn the lock clockwise.Close the shaving unit until you hear a click. Note: If the shaving unit does not close smoothly, check if you have inserted the shaving heads properly and if the retaining frame is locked. Three Philips Norelco HQ8 replacement heads. Great blades for a great shaver.